Pink is not only a Barbie color anymore- it's much more than that! If you're following me on Instagram (@thetrendique), you'll definitely know that I'm slightly (or heavily...) obsessed with the color pink. 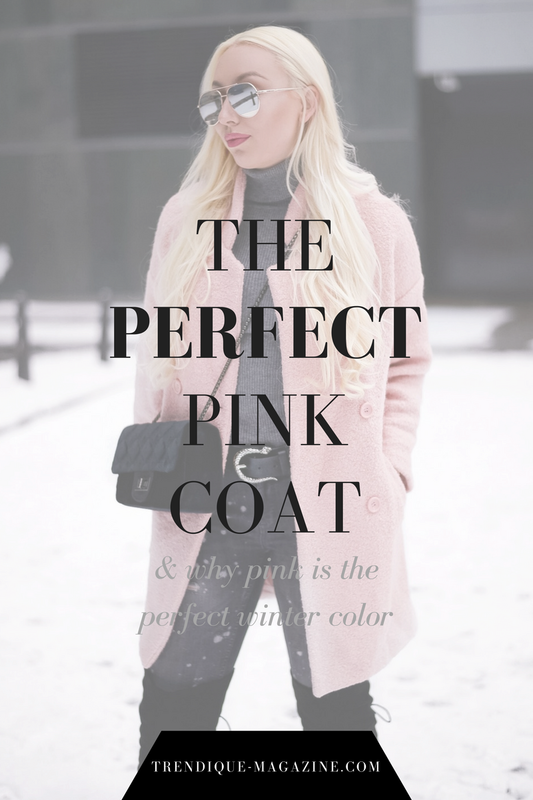 Continue reading to find out all about the perfect pink coat and why pink is the perfect winter color. You might think that all you can wear during winter season is black, grey and dark colors in general... but no- there's something much better and brighter than that! PINK! Yes, you heard right. Pink is the new black! Pink and light pink shades are super on trend this season. Wearing a pink coat truly brightens up any dark winter day! I was on a hunt for the perfect pink coat for quite some time and finally found the perfect shade I was looking for. The quality is great and it really keeps you warm. Especially with a turtleneck underneath. Well this post has definitely convinced me that pink is the perfect color for winter time :) I love how bright and cozy it looks at the same time! Thanks so much for sharing love! Lovin the belt you paired with it! The buckle has such beautiful detail. I absolutely love pink jackets! I'm in love with your coat, so chic !